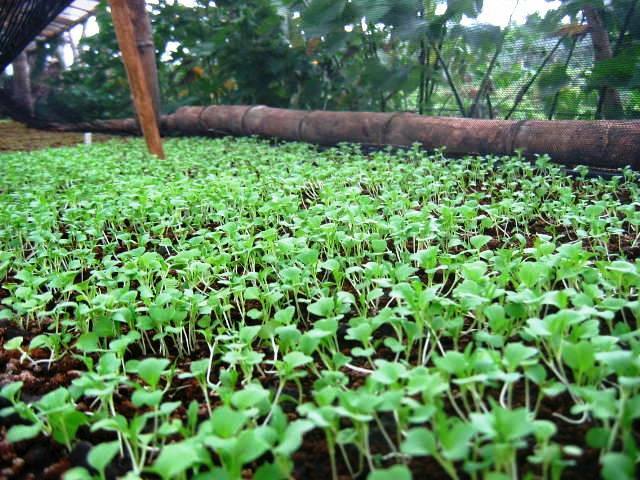 Organic Greens | Our Farm by Earth Flora Inc.
We’ve had several bountiful harvests of micro greens. What are micro greens? 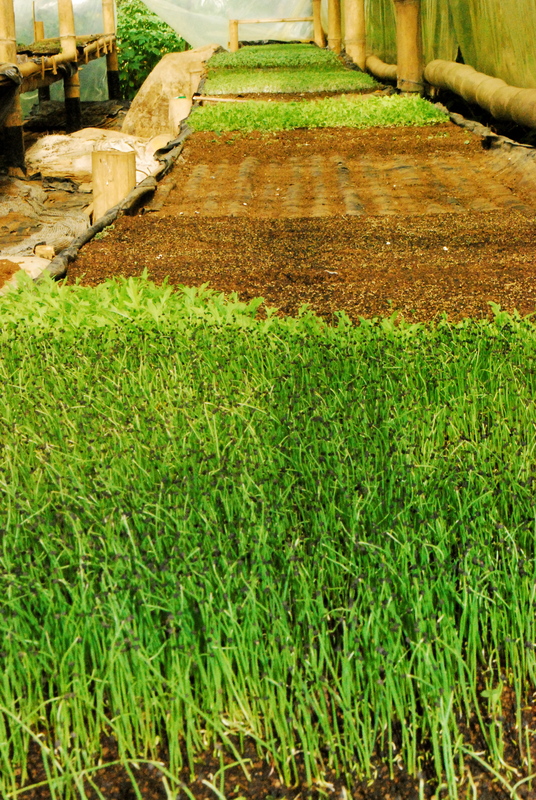 These are edible greens, lettuces and herbs that are harvested as young plants. They are about a tiny 1 to 2 inches long, leaves, stems and all. The greens have an intense flavor and are used for garnishes or to enhance the flavors of dishes just like your herbs. 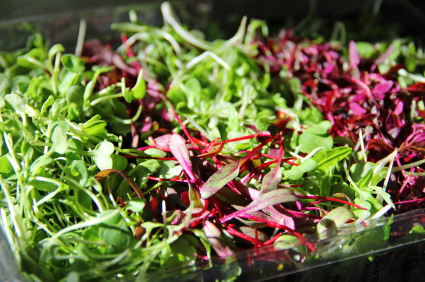 Micro greens have been making the rounds of fine dining restaurants and bistros, as they are beautiful and distinct. The more common varieties are: Arugula, Beets, Basil, Cabbage, Celery, Chard, Cilantro, Fennel, Kale, Mizuna, Mustard, Parsley, Radish and Tatsoi. Micro greens are not sprouts. 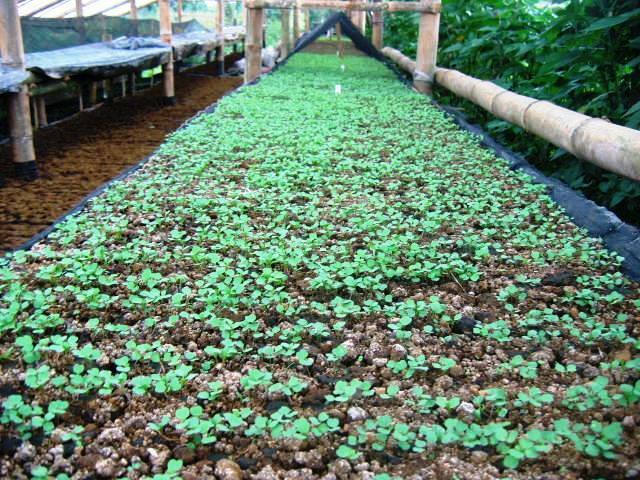 Sprouts are germinated seeds and are produced entirely in water or in soaked cloth bags. The seeds of sprouts are in fact not actually planted! Micro greens are planted and grown in soil, just like your regular greens. They are grown outside, in high light, low humidity and good air. We fertilize them with organic fertilizer. Most micro greens are ready to harvest in 2 weeks while some take 4-6 weeks. These are when the greens have developed their first set of true leaves. We cut them above the soil surface and pack these without the roots. One reason why micro greens are often dubbed as pricey is because we cannot get additional harvests of the planting of micro greens. We always have to plant another crop after each harvest. Among our micro greens are: Micro Amaranth, Micro Cilantro, Micro Onions, Micro Tatsoi, Micro Radish, and Micro Arugula. These are those tiny leaves you see in upscale restaurants. Micros add beauty and flavor to dishes.